You typically find E-mail Setup for mobile devices in the “Settings” app. From there, find “Add Account” or “Add E-mail” and choose “Other” when you see the type/brand of E-mail Account. E-mail setup in traditional E-mail clients such as Outlook or Windows Live Mail is usually found in the program under File > Accounts or Mail Accounts. Notes: not all settings may be needed; using IMAP will “sync” your email so email you delete from your phone may be deleted from other devices as well. If you have changed your email password and need assistance making the change in your email program or device settings, visit our password instructions page. TCC includes Junk E-mail & Virus Filtering with TCC E-mail accounts. Our filtering sends “Daily/Spam Digest” E-mails with your recently filtered messages so you can easily release them if you wish. You can view all filtered E-mail along with “Friends” and “Enemies” lists (permanently allow/block by address). If you would like to change your E-mail password, go the Change Password website (https://portal.airstreamcomm.net), login with your email address and password and enter your current and desired passwords. If you do not know your current password, contact TCC. If you need to change your password on your devices and would like assistance, try these instructions. If you are having issues with sending or receiving E-mails, contact our Help Desk: 1.888.655.8642. Find the “Wireless” settings on your device and click or open it. Wireless (Wi-Fi) signal is limited by distance, obstructions, devices connecting, and electronic/airwave interference. Placing your router in a central location, off the floor and away from outlets, cords, appliances, fluorescent lights, and large metal objects gives you the best opportunity for a strong signal. Depending on the size/shape of your house and where you are trying to get signal, you may need a repeater or access point to boost your Wi-Fi signal. Some routers broadcast two frequencies- 2.4 Ghz and 5 Ghz. Data traveling over the 2.4 Ghz signal reaches further but has a lower potential speed (55 Mbps) while data over the 5 Ghz signal is much faster (up to 800 Mbps) but the signal does not reach as far. Connect your newer devices and those streaming video or playing online games to the 5 Ghz signal and connect your older devices, those further away, and those just checking email and browsing the web to the 2.4 Ghz signal. TCC now offers “Managed Wi-Fi” to provide you with the equipment, setup, and support for the Best Internet Experience. Included with Managed Wi-Fi is a Gigacenter Router, a Mesh Signal Extender, Installation, Connection of Your Wireless Devices, and Ongoing Support. Learn more about Managed Wi-Fi. TCC Pro-Tech services: TCC can have a technician come to your house to set up wireless devices, check and improve your wireless network (including installing wireless extenders, if needed). TCC Pro-Tech services are billed at $100/hour for any non-service issues. Your connection consists of a TCC Router connected to fiber or coax at your location. The router can then connect to your devices both wirelessly and wired (ethernet). We can remotely access our equipment to check signal and status and set, recover, or change Wi-Fi settings for you. We cannot, however, assist with any equipment you provide yourself. TCC offers computer repair via Security Coverage (accesses your computer remotely through Internet) and local computer technicians able to promptly and affordably fix your computer, update the hardware or software, clean it of any viruses, transfer pictures and email to a new computer and many more services! Our turn-around time is fast and our rates are far less than other area computer services. TCC provides Internet tech support to TCC.Internet customers free of charge. Now more than ever there are scams, fake emails and infected websites trying to get us. There are dozens of them going around at any given time. Some come in by email, others by phone call and still others through web sites you visit. Almost all of them require your participation at some level – whether that is clicking on a link or file from an email or agreeing to something over the phone. TCC now offers a new package called “Tech Home” that includes Anti-Virus, Cloud Backup, and Password Manager to help protect your computers and data. The Tech Home “Protect” plan is included with TCC Internet and protects 1 PC and 1 mobile device. To protect additional devices and for complete Wi-Fi support, you can upgrade to the Tech Home “Protect Plus” or “Support” plans. Learn more about Tech Home. Click the PLAY button below to listen to an actual call one of our staff members received! Don’t believe emails saying you’ve won something, owe something, or need to confirm something – just delete them! Don’t listen to somebody who calls and says you have a virus; just hang up! DO have a good Anti-Virus program. Don’t have one? Get SecureIT+ which is part of our Tech Home! DO call us if you have any questions or want to verify something! DO bring your computer to TCC if you get infected; our tech’s can get your computer cleaned quickly and affordably! 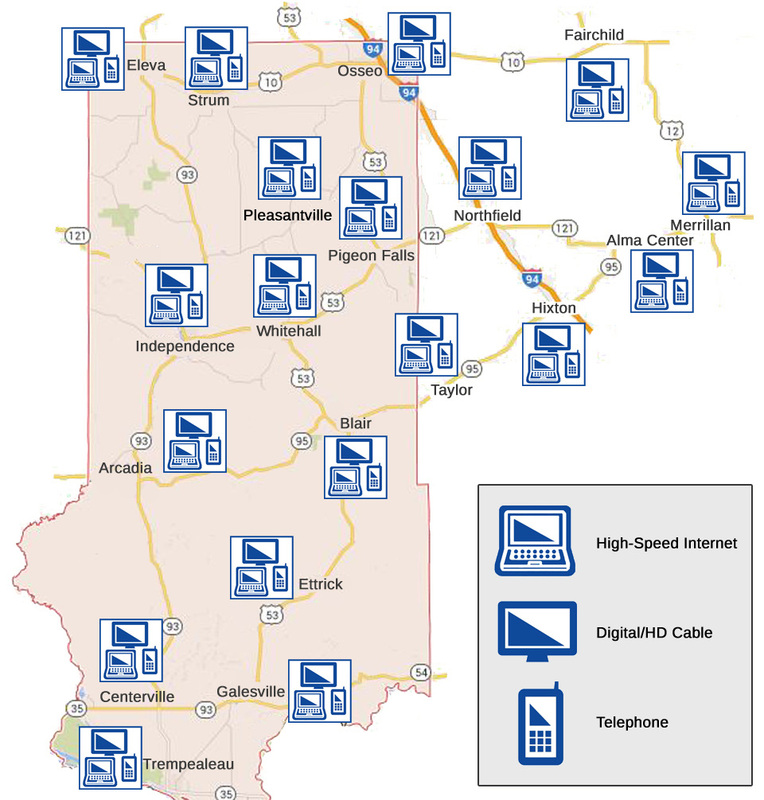 TCC serves the following communities with Internet: Alma Center, Arcadia, Blair, Centerville, Eleva, Elk Creek, Ettrick, Fairchild, Galesville, Hixton, Humbird, Independence, Merrillan, Northfield, Pigeon Falls, Pleasantville, Osseo, Strum, Trempealeau, Whitehall. We generally offer service in each town and in limited areas outside of town. In Eleva, Strum, Independence, Northfield, Pigeon Falls, and Pleasantville, we are the incumbent telephone provider and offer Internet, Cable, and Telephone services to all addresses in those areas. Click/touch map for larger view. Internet services provided by Tri-West Communications, LLC – a TCC company.